I often wonder WHAT made someone decide to become an Entreprenette. Do you? When I graduated college and got a job in the movie business, I never thought for a second about being an Entreprenette. I was just going to work in the film business forever and find my fame and fortune there. Even though I come from a long line of entrepreneurs of all kinds (Fashion Designers, Linen & Sheet Designers, Factors, Shrinks, Dentists, Deli Owners and more I’m sure), it really never occurred to me to follow in their footsteps as I didn’t feel passionate about anything in particular at that time……except for perhaps a guy or two! 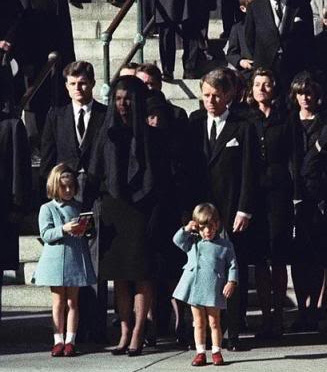 This famous photo shows JFK Jr in a coat from my Grandma’s Imported Linens and Children’s clothing store in NYC – Jackie shopped there a lot. When I did have my Ah-HA moment – I finally understood the reason I was taking the plunge and what was so alluring about being my own boss. I love hearing others stories and thought you might too. A big thanks to my Experts who contributed their stories to inspire and guide you. These are great – I could relate to so many of them! 9-5 Just doesn’t cut it for me. My wife and I have such big dreams: adopt a girl from China, open a full size “ranch” so we can look after kids that aren’t wanted. Everything takes time and money, and with a job, you don’t have either. All these things have driven us to do everything we can to succeed, and the response from people that have dealt with us has been awesome! Everyone appreciates someone that will look after them, even when money isn’t exchanged… rest assure, eventually it will. So my best tip is to make sure you give your best service to everyone, not just the people that pay you, you never know what might happen with it in the future. These tips are great. Of course, as a book writing coach, I’m partial to number 16–the entreprenette who became an author! Even a seasoned entrepreneur can get lots of useful tips from here. I found the “Don’t outsource” tip interesting and somewhat controversial. I think it’s true that one shouldn’t outsource too soon or too much and that one should always weigh whether outsourcing a particular task will bring in revenue or save enough time to justify. But once your business grows, strategic outsourcing becomes key to growth. Thank you for sharing your stories. I will take your words of wisdom to heart as I transition my business to full time. #75 is my favorite reason (taking control of your destiny). IMO, “job security/stability” has become a myth. The only job security there is these days is what you build yourself, ie, start a business. With the economy being what it is today, it simply amazes me that more people don’t turn to entrepreneurship instead of looking for a job — especially as it can be so cheap to start one nowadays. Just my 2 cents; great post! You made some really good ideas there. I did a searching on the niche and uncovered a lot of people may consent having your blog. Some very inspiring stories. I think being an entrepreneur is the truest form of expression. There are a lot of rewards available to those willing to take risks and work hard. It is great to read so many inspiring stories. I would also like to transition to entrepreneurship and these examples have made me feel more confident.